All metal, knockdown-style 6” f/5 travel Newtonian co-produced by RP-Astro (Italy) and Kasai. Becomes a compact octagonal box by jointing the secondary cage and the primary cell, fitting into a suitcase or a travel bag. 3kg lightweight OTA can load onto a photo tripod, and even “hand-held” observing is possible. 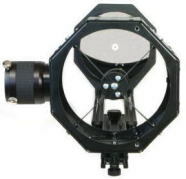 2” helical focuser accepts widefield low-power eyepieces for deep-sky observations, while thin vane spiders and small central obstruction ensure good performance for planetary observations. 3-step back and forth fixing function of the secondary cage enables the back focus adjustment. 3-angle rotatable secondary cage to fit the observer’s dominant eye and the mounting types. Many other unique ideas for travelling observers are incorporated. Cool Italian design and good finish are also attractive. 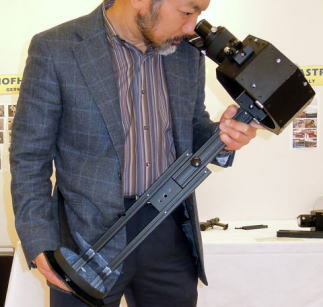 “Shall we make a maximum aperture telescope that can fit into a suitcase or a travel bag?” – This suggestion by Kasai to RP-Astro lead the co-production of Zingaro-6. 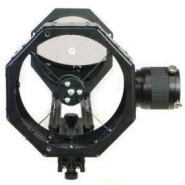 To assure lightweight and compactness, the primary mirror is 3-point glued to the cell plate. Strong adhesive with high elasticity prevents deforming of the mirror surface by temperature changes, maintaining good optical performance anytime. Besides, enough room is kept between the mirror backside and the cell plate to quicken the thermal acclimation. Primary mirror cell is equipped with push-pull thumbscrews, helping the collimation works with no tools. The offset secondary mirror is also 3-point glued to the cell plate, held with 1mm thin 4-vane spiders. Regular octagonal pillar shaped secondary cage consists of 2mm thick durable aluminum alloy plates, with 2 baffle rings for reinforcing the cage and eliminating the stray lights. This cage can be rotated and fixed in each 90-degree angle. 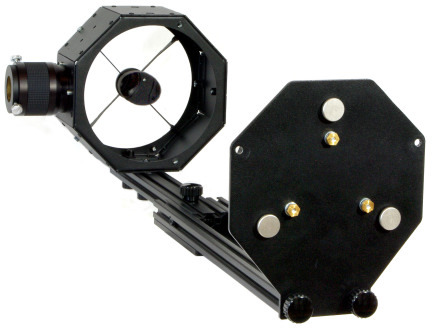 When mounted onto a photo tripod or a fork mount, horizontal focuser position is useful. And, when mounted onto a T-shaped altazimuth mount or a german equatorial mount, diagonal focuser position is easy to observe. Besides, depending on the observer’s dominant eye, horizontal focuser position can be switched to the other side. 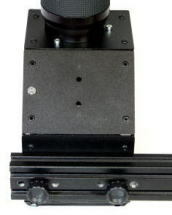 To complement this rotary function, the screw holes for finder bases are positioned on both upper and lower side of the focuser, assuring the finderscope is not placed under the focuser. Also the cage can be fixed in 3-step forward and backward. 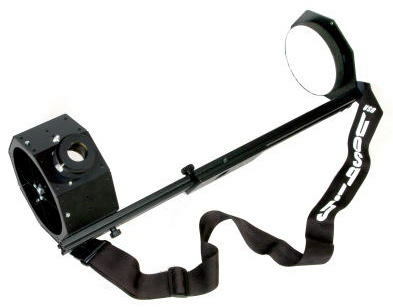 This function enables the back focus adjustment to reach the focus with all your eyepieces. 35mm travel smooth 2” helical focuser comes with a 1.25” adapter (w/M48 filter threads.) Brass compression rings in both the eyepiece adapters. The absolute requirement for the joint bar is solidity. Considering the portability, however, heavy or bulky material must be avoided. To solve this conflict contradiction, very sturdy but quite lightweight aluminum alloy special angle frame bars are chosen. As for the contraction method for transport, not a normal sliding system which may cause backlash or bending, but a simpler folding system is adopted. The weight of the joint bar is only 830g, yet it keeps the parallelism between the secondary cage and the primary cell, not causing backlash or bending even when a heavy eyepiece is used. The base plate to fit the mount is 6mm thick aluminum alloy, with two 1/4” (35mm distance) and one 3/8” threaded holes to fit photo/video tripods and dovetail plates (optional) to fit various mass-market mountings. The major feature of this scope is to become a compact octagonal pillar when the secondary cage and the primary cell are jointed together. Adding the metal dustcover (standard accessory), it becomes a sealed box with the optics housed completely. 190mm x 190mm x 105mm compact box can fit into a normal suitcase or a travel bag. As both the optics are protected with surrounded sturdy metal plates, even rough treatments won’t make any damages on the optical surfaces. The joint bar becomes a 380mm x 80mm x 30mm thin plate when folded, fitting into the bottom in a travel bag or the narrow gap inside a suitcase. As the total weight is only 3kg, no need to care about excessive weight when the luggage is checked in. You have only to bring Zingaro-6, eyepieces and a photo tripod, then you can enjoy deep-sky viewings with 6” light gathering power. (If your luggage should have no room for a tripod, “hand-held” observation is also possible with a guitar strap - see below). Thanks to the simple construction, it takes only a minute for assembling & disassembling. This distinguished mobility is one of the important advantages of Zingaro’s. The size after folded is like a little large dictionary or a yellow page, so it can be stored in a bookshelf together with other books. This extreme compactness is one of the important advantages, too. Travelling overseas is a good chance to see unknown deep-sky objects. Even travelling within your country, if the sky is dark and clear, it’s natural to have a feeling to observe deep-sky objects with not so a small aperture telescope. In such cases, you have only to throw Zingaro-6 into your travel bag, then you can enjoy beautiful skies with a 6” aperture at any time. It’s so compact as stored in a bookshelf, so you can see the skies at your balcony whenever you want to, just taking out the scope from you bookshelf. This “book-sized” scope will surely bring a lot of fun for both in your travels and home observations. Too much luggage and have no room for a tripod? Or, is it tiresome to take out a heavy mounting to the balcony? In such cases, you can try an easy "hand-held" observation with Zingaro-6. Just get an electric guitar strap ("Gibson" is recommended) and connect either end to the secondary cage fixing screw and the primary mirror fixing screw, then rest it on your shoulder. You can use up to 30x - 50x in good stability, better than you've imagined.